If you haven't been following the case of Phil Dominguez lately, then you don't know that the legal battle he has going on is serious, and it has taken a huge financial toll on him. He has not only had to bail himself out of jail and pay all of the legal fees up to this point (which have been considerable), but he has had his house raided and removed of all and everything considered weaponry. Numerous pro-gun blogs, gun rights groups and other second amendment defenders have taken on Phil as their poster boy for what is slowly happening to America. Our rights are being stripped from us one at a time and often in ways in which we are being told is for our own safety. B.) Once I get to the public place in which Im going to unleash my wrath upon humanity, I can only be charged for firing my weapon at the people I'm shooting at, because the crime scene WAS my destination, so technically I made no stops along the way (considering I didnt have the shits, or need gas) and you can't add that to my charges. Laws like these were put into place so that when a person like Phil (or you and me) comes along, the press and the legal system can play it up to the public in a way that scares us into thinking we need stricter laws to help save us from "mad men" like Phil. I mean seriously, criminals arent law abiding citizens, that's why they are called CRIMINALS. Who is this law really for? 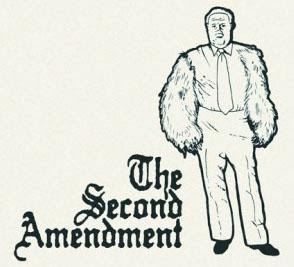 Next thing you know we won't have the right to bear arms at all. Phil and I have been friends along time and we have been talking during all of this. He has asked me to post up some information about his case in hopes that the paintball community which he has always and proudly been a part of, might take the time to look into what is happening to all of us indirectly, through him.
" On Friday, January 9, 2009, Fox 11 News reported the arrest of Mr. Phillip Dominguez at Los Angeles International Airport. According to the Daily Breeze, Mr. Dominguez was on his way to pick up a friend arriving at the airport and then go shooting at a range. The L.A. Times reported "authorities said that there was no indication the man intended to cause harm at the terminal." 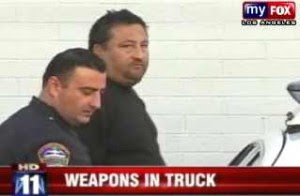 In a follow-up report Fox 11 News then called Mr. Dominguez a "knucklehead" for being in possession of a number of firearms and thousands of rounds of ammunition while driving into Los Angeles Airport. What the media fails to understand is that there is nothing illegal, nor even particularly startling to firearm owners who understand what a trip to the range entails. The arrest was only the beginning. On the following Tuesday morning, January 13, 2009, at approximately 6 a.m. Mr. Dominguez's home was raided by the Los Angeles Police Department Gun Unit. While still in their pajamas, Mr. Dominguez, his wife and two daughters (ages 17 and 13), were led out of their home at gun point by LAPD. Mr. and Mrs. Dominguez were handcuffed for six hours while officers seized thousands of dollars in property, including all his (and his wife's) firearms, magazines, and boxes of ammunition. The law firm of Trutanich-Michel, LLP was retained by Phillip Dominguez concerning his criminal case. Mr. Dominguez was arraigned on February 6, 2009. The complaint alleges 11 counts, eight felonies and three misdemeanors. Mr. Dominguez is charged with three violations of California Penal Code section 12280(a)(1) transportation of an assault weapon for: a Springfield Armory M1A SOCOM II, a Kel-Tec SU-16 Rifle, and a Spikes Tactical ST22. One count of violation of Penal Code section 12280(b) possession of a Mauser Semi Auto Rifle. One count possession of a short barrel rifle pursuant to Penal Code section 12020(a)(1). Three counts possession of a deadly weapon under Penal Code section 12020(a)(1). And three misdemeanor counts; possession of a concealed firearm in a vehicle, carrying a loaded firearm in a vehicle in Los Angeles, and possession of testosterone enanthate. Trutanich-Michel has received numerous calls about the status of this case, the charges, and inquiries about what people can do to help. Contributions to Mr. Dominguez's defense fund can be made by check sent to Trutanich Michel LLP at 180 E. Ocean Blvd. Suite 200 Long Beach, CA 90802. Please indicate in the subject line: "Dominguez Defense Fund." Tax deductible contributions can be made to CalGuns Foundation. Make sure that the donation is marked for "Mr. Dominguez's Defense Fund." Chuck Michel plans on fighting this case to the fullest, meeting with the prosecution, and resolving the case to a just conclusion." Pass this along to everyone you know. This may sound stupid and insignificant to you now, but not only is this real and serious to Phil (a law abiding registered gun owner), but it will become real and important to you sooner than you think if we allow these law makers to take away our rights.